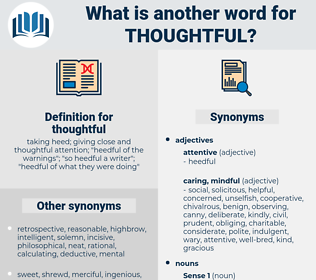 What is another word for thoughtful? taking heed; giving close and thoughtful attention; " heedful of the warnings"; " so heedful a writer"; " heedful of what they were doing"
considered, informative, sensible, intelligent, in-depth, judicious, well-designed, attentive, sweet, conscientious, weighted, detailed, meaningful, prudent, profound, clever, well-balanced, watchful, lovely, gentle, mature, gracious, well-informed, painstaking, skilful, sound, delicate, sophisticated, interesting, helpful, delightful, balanced, enlightened, deep, deepest, savvy, smart, smarter, conscious, informed, vigilant, astute, diligent, measured, comprehensive, rational, knowledgeable, mindful, exciting, serious-minded, right-minded, reasonable, polite, shrewd, cautious, friendly, sensitive. thought-provoking, thought-out, well-considered, thorough, reflexive, reflective, insightful, well-reasoned, thought-through, purposeful, circumspect, meticulous, wise, caring, deliberate, serious, nice, thoroughgoing, rich. inconsiderate, rash, discourteous, uncivil, unmindful, impolite, imprudent, inattentive, unthoughtful, rude, incautious, uncaring, indiscreet, careless, ignorant, obtuse, stupid, heedless, unmannerly, unrefined, negligent, uncareful, mean, remiss, idiotic. happy, flippant, unreasonable, unserious, trivial, unimportant, irrational. ill-advised, malevolent, brainless, spiteful, unadvised, goofy, hasty, hit-or-miss, unkind, purposeless, hurried, rushed, impetuous, abrupt, extemporaneous, light-headed, unkindly, casual, sudden, unhelpful, inhospitable, unstudied, impromptu, malicious, chance. But she had been too tired and storm - tossed to be thoughtful.